LONG gone are the days when renewable energy was just for the ultra- progressive. 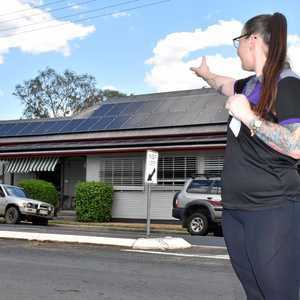 With the rising cost of electricity, Australians are finding their own way to cut costs and the Bellevue Hotel in Coominya is one of the latest places to install solar panels. Manager Skye Stoessel said electricity bills would be dramatically reduced thanks to the solar panels. “When it’s hot like it is, we can cut our bills down by a third,” Mrs Stoessel said. The renewable energy fix had been in the works since October 2017, when the present owners purchased the hotel. Mrs Stoessel said the owners wanted to find a way to beat the significant electricity costs. “With the rising cost in energy, this place with the kitchen and the fridges, we can be paying thousands a month for our power bill,” she said. More than 65 panels cover a large portion of the roof on the historic pub. Linked to a 19.8-kilowatt system, the panels will help power the functional kitchen, air conditioning and the multiple fridges at the establishment. While the dollar value of savings could not yet be confirmed, Mrs Stoessel said the return on investment would go towards improving the hotel. “With the savings from the power bill we will definitely be putting it towards getting a few things fixed, restored and upgraded,” Mrs Stoessel said. “It’s quite exciting to see what we will save and what we can put that money towards in restoring the building. The renewable energy crusade is gaining momentum across Australia, with pressure groups like the Fair Dinkum Power movement pushing for Australia to go “200 per cent” green. They believe Australia should be powered only by renewable energy and should also be exporting renewable resources to international markets.